is illustrated with case studies from a range of languages including Finnish, Russian, English and French. 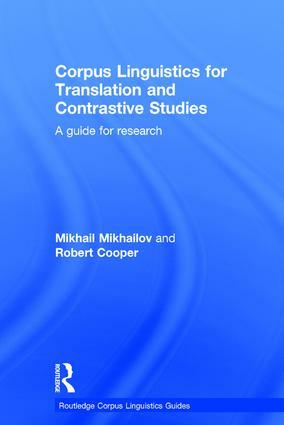 Written by two experienced researchers and practitioners, Corpus Linguistics for Translation and Contrastive Studies is essential reading for postgraduate students and researchers working within the area of translation and contrastive studies. "Corpus Linguistics for Translation and Contrastive Studies is an invaluable guide to methods and procedures for dealing with multilingual corpora as well as a source of ideas for how the corpora can be used for different types of linguistic research." "This is an excellent book which fills a genuine gap very well. The authors are highly experienced, and the book communicates their expertise clearly and thoroughly." Mikhail Mikhailov is Professor of Translation Studies (Russian and Finnish) at the University of Tampere, Finland. Robert Cooper is a former Lecturer in English at the University of Tampere, Finland. Routledge Corpus Linguistics Guides provide accessible and practical introductions to using corpus linguistic methods in key sub-fields within linguistics. Corpus linguistics is one of the most dynamic and rapidly developing areas in the field of language studies, and use of corpora is an important part of modern linguistic research. Books in this series provide the ideal guide for students and researchers using corpus data for research and study in a variety of subject areas. This series was co-founded by Ronald Carter (1947-2018). If you are interested in contributing to this series, please contact the Series Editors, Michael McCarthy and Anne O’Keeffe (Anne.OKeeffe@mic.ul.ie).